This year represents an important anniversary for me in teaching. Ten years ago I was attending OISE/UofT, completing my Bachelor of Education. I hadn't gone straight into teaching after my first round of university, instead working and traveling around Ontario taking courses the meet my diverse interests (among them a hands-on mosaic class, Aanishnaabemowin ("Ojibwe language"), and tabla drumming). I had many passions and was trying to become a jack-of-all-trades instead of choosing a career which I felt would limit my horizons. It was the example of a dear school friend, whose mother was a teacher in the public system and who was herself a teacher in the Waldorf system, that influenced my decision to teach. D'Arcy's genuine sense of wonder at the world makes her the ideal primary school teacher. Her delight at children's way of thinking and her humour always delighted me. I loved being around kids, but wasn't certain I had what it takes to lead a class. To test myself, I began telling stories at the "1001 Nights of Storytelling" Friday evenings in Toronto. It was an education in oral literature, humour, as well as a tremendous confidence-booster. I still try to make time to catch the professional storytellers at the various festivals in town, even though I no longer participate in telling. It wasn't until I had my first child, however, that I made the time to volunteer in classrooms and begin the application process for teacher's college. That first spring, while my boy was enjoying the fresh country air at the grandparents' house, I volunteered in D'Arcy's mother's grade one class. Myra was the best example of gentle classroom management I have seen: she treated the students with such dignity and gave them room to make mistakes and correct them, when many of us may have pushed for apologies or restitution. She followed the students to grade two in September, and I was once again able to join her class and learn how to cultivate a caring classroom environment. There I observed that the most important lessons learned in class are not the facts or academic skills, but the social aspects: learning how to learn. To this day I admire Mrs. Colby's example and I credit her for the big ideas I learned about the social curriculum of any classroom. 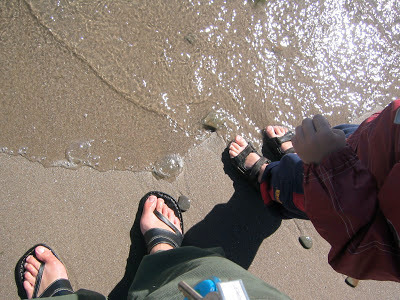 Me and my boy at the beach: his first week of school, my first year with my own Kindergarten class. 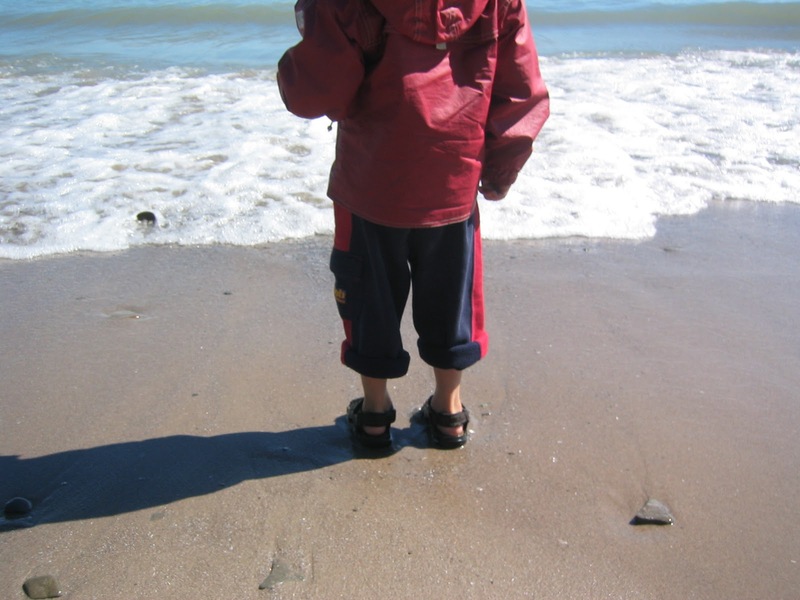 I started at OISE with a toddler at home. I knew from my own experience that I related best to primary students, but tried my hand at every age up to grade eight. It was later, when I began occasional teaching (supply work) that I realized I was happiest in a Kindergarten room. My year at teacher's college was filled with exciting projects, each arts-infused and cross-curricular for all ages. I taught with several other teacher candidates who became friends. It met my need to follow many interests at once, and for that I was grateful. Once again, however, the particular lessons or skills I gained there are mostly forgotten in the interim. 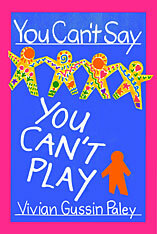 The social lesson that never left me was from a book called: "You Can't Say You Can't Play" by Vivian Paley. We candidates were discussing how to create a welcoming climate in one's class when we read an excerpt from this incredible book. I now see it as a teacher's inquiry project into building inclusion into her program, but at the time it seemed both radical and unavoidable at the same time. Years later I found an interview with the author on my favourite radio/podcast (and the inspiration for the title of my blog): "This American Life". Vivian's big experiment was surrounding a fact she observed in her Kindergarten classroom: "Kids saying over and over: "No, no room here", "No, I promised to play the next 16 games with someone else", "No we're already playing, you can't join in", "No, you cannot play with us", with the same kids always relegated to the role of the outcasts". Her discomfort with the "hidden curriculum" of certain students creating social heirarchy led her to propose a new rule: "You can't say 'You can't play'". L: "But then what's the whole point of playing?" N: "You just want Cynthia"
L: "I could play alone. Why can't Clara play alone?" A: "I think that's pretty sad. People that is alone they has water in their eyes"
L: "I'm more sad if someone comes that I don't want to play with"
Teacher: "Who is sadder, the one who isn't allowed to play, or the one who has to play with someone he or she doesn't want to play with?" C: "It's more sadder if you can't play"
L: "The other one is the same sadder"
A: "It has to be Clara, because she puts herself away in her cubby, and L can still play every time"
L: "I can't play every time if I'm sad". It is a difficult story to read for anyone who has been that child told "No, you can't come in". I dreaded the outcome as I read on and saw that students initially rejected the idea, especially the student "L" for whom the current arrangement was a source of power. I was delighted, then, to read on and see: "Once the rule kicked in, within a week, it was as if this had always been the way life would be". Paley describes the experiment to Ira this way: "Can you legislate this type of morality, can you order people to be kind, not to exclude others? ... Once the rule was in effect, there was a palpable sense of relief in class, as if they'd been rescued from meanness. The children were grateful for structure that let them feel good about themselves and each other". I carried this lesson with me into my practice, first as an occasional teacher and then with my own class. I was quick to intervene when students were denied access into games or centres. The divisions persisted, however, as I was teaching whole-group lessons that required whole-group response time. I see now how natural it is for students to compare themselves to others when they are all working together, especially when the work isn't open-ended. I saw how students with fine motor strength were able to finish printing assignments quickly and head off to the highly favoured areas of the classroom, while their slower friends struggled to complete the task. The consequence of this "task-first, then play" practice interfered with students' ability to choose where to play, as the water table, sand area and big blocks would be filled up first. A heirarchy formed, in spite of my best efforts. It began to change when I started making little changes to my structure, supporting self-regulation by allowing students to choose when to complete their tasks. Later still the whole-group tasks gave way to project-work, intentional play, and a greater focus on oral language development. I have seen the difference in the way that students understand one another, now that they are free to develop their skills in the area of their choice. The most delightful surprise of my change came in the way that students now play: the freedom to choose adds to the motivation to persevere through difficult challenges. Students who may have balked at writing when there was a "writing centre" are leaving notes on their creations, signing up for sharing time, and writing books with me. They are, as I quoted Lilian Katz saying a few posts back: "learn(ing) the academic skills in service of (their) interests". D'Arcy dancing with the boy, age 3. In talking with my friend D'Arcy over the years, I have seen our practice grow closer and closer, even though our schools remain fundamentally different. 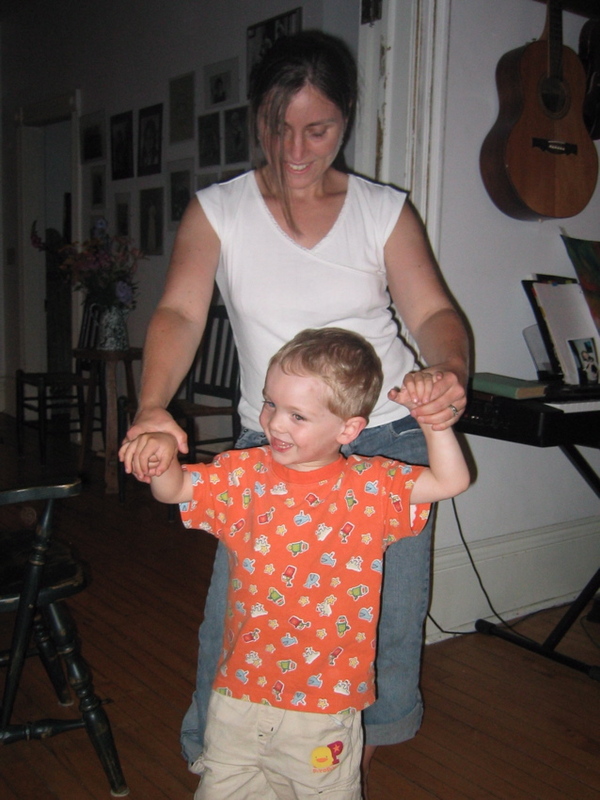 Her experience of teaching in both the Waldorf and the public school system gives her a uniquely broad perspective upon teaching and learning. Embracing emergent curriculum and letting Reggio-inspired influences into my classroom have made my practice much more creative, responsive to students' needs and interests, and in a way that I hope approaches the wonder of the world that is highlighted in Waldorf schooling, more magical. D'Arcy continues to be a good friend and a motivator to keep pushing my boundaries beyond what is comfortable. Part of the reason I struggle so much with my classroom set up is I want each space to hold 20 kids-just in case. I never want a station to be full. What a lovely post!